The terms "Peranakan" or "Baba Nyonya" or "Straits Chinese" are often used interchangeably to describe the descendants of Ming Dynasty Chinese immigrants who settled along the Malay Peninsula, which encompasses parts of Malaysia, Indonesia, and Singapore. But the ethnography of this region is actually so complex that entire books have been written on the differences in ancestry and culture between these peoples, such that the common practice of interchanging these terms is technically incorrect. Nevertheless, for our limited purposes of explaining the origin of this item, it is best understood simply as an artifact of certain Chinese peoples who settled in Southeast Asia. This fantastic piece is made from carved pinewood, and is actually composed of several parts. The chai hup itself is the three-tiered structure seen on top: It is carved in open-work style with scenes of figures and fretwork, then lacquered in black and red. The figures and parts of the fretwork are also gilded. As depicted here, the chai hup is actually sitting atop its cover, which is the hexagonally shaped piece on the bottom also made from carved pinewood. 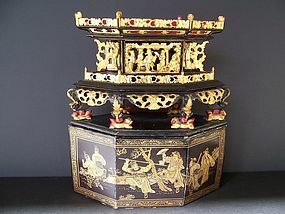 It is lacquered in black and very well-painted with scenes of warriors in gilt on one side, and a landscape scene on the other side. When not in use within a traditional Peranakan home, the chai hup would ordinarily be enclosed and protected by its cover. But when displayed as an art object like here as we have seen done in museums, it makes for a very striking presentation. A very rare and beautiful object indeed, and seldom seen in Western collections. Size and Condition: As displayed, this piece is 15 inches tall, 13 inches wide, and 5 inches deep. The chai hup itself is in excellent condition. As a cherished object within a Peranakan home, it would have been protected by its cover most of the time, and thus has only minor wear and nicks to the lacquer. The chai hup cover however, has borne more the brunt of its age, with several areas of nicks and dings to the lacquer, and splits along the seams of the pinewood. None of this is especially serious however, and is all just indicative of its age and authenticity.